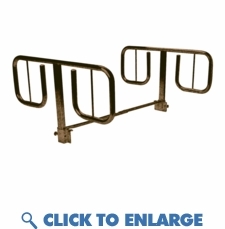 This sturdy hospital bed rail has an attractive brown power coated finish. It is constructed of 1" steel and was newly designed to prevent the rail shaking like older half rail systems. Providing maximum protection while the bed frame is elevated this hospital bed rail offers sturdy support without confining the patient. Easy to assemble designed for use with most manufacturers' beds. *works with pan style, standard hospital beds, semi and full electric including bariatric beds. This sturdy hospital bed rail has an attractive brown power coated finish. It is constructed of 1" steel and was newly designed to prevent the rail shaking like older half rail systems. Providing maximum protection while the bed frame is elevated this hospital bed rail offers sturdy support without confining the patient. Easy to assemble designed for use with most manufacturers' beds. *works with pan style, standard hospital beds, semi and full electric including bariatric beds.